These days, we're used to sharing all kinds of information about us with third parties—whether we are aware of it or not. With modern social media and communication apps, it's just a habit for most people to put themselves out there and to broadcast what they are doing openly with their friends and acquaintances. But what if there are some things that you'd like to just keep to yourself? What if you'd like to share some information with some people, but not with others? Luckily, with WeChat you do have some control over your privacy settings, which can help you choose who you want to engage with and who you'd rather ignore. What Are WeChat Privacy Settings on iPhone? How to Apply? Friend Confirmation: This is where you can control whether or not someone add you as a friend with your permission. Add Me as A Friend: With this setting, you can control how people can add you. For example, you can disable their ability to add you via WeChat ID. Find Mobile Contacts: Disabling this will make it so that you are not automatically connected with people on your mobile contacts list. 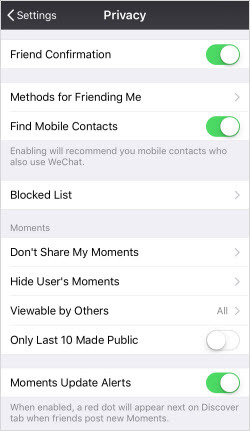 Block List: With this setting, you can manage the people who you want to block from your WeChat. Don't Share My Moments: You can also have a list of people with which you don't share your moments. Hide User's Moments: Similarly, if you don't want to see someone's moments, you can hide this function from yourself, too. Viewable by Others: This will limit others to view your moments. Moments posted before 3 days or 6 months will be hidden from friends. Only Last 10 Made Public: If you enable it, strangers can see your 10 most recent moments shared to all. If you are concerned about privacy, it's probably best to disable it. Of course, the above steps are just some preliminary measures that you can take to protect your privacy on WeChat using the Wechat privacy settings. If you really care about your privacy, though, there is much more to be done. Your biggest vulnerability is if someone just decides to snoop on you. You can try to delete your history or other information on WeChat, but manually deleting on your iPhone doesn't actual erase this data. It is still recoverable. The only way you can really keep your private data safe is by permanently erasing your private WeChat data. 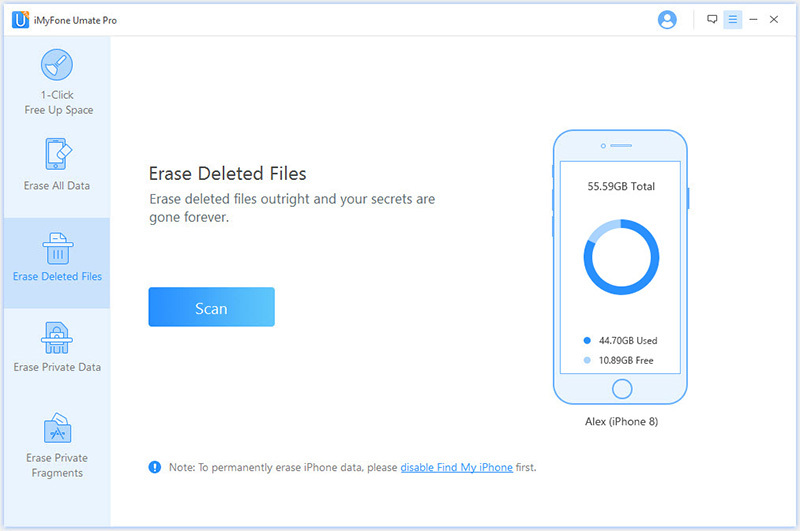 One great way to do this is by using iMyFone Umate Pro iPhone Data Eraser, which support to permanently erase WeChat messages and attachments. Step 1: Click "Try It Free" buttons above to download iMyFone Umate Pro on your computer. Connect your iPhone to it. Step 2: Choose erasing mode from the left panel. Then click "Scan". Erase Private Data: This mode will scan and erase current WeChat chats, including messages, videos, photos, word/excel/ppt files, etc. 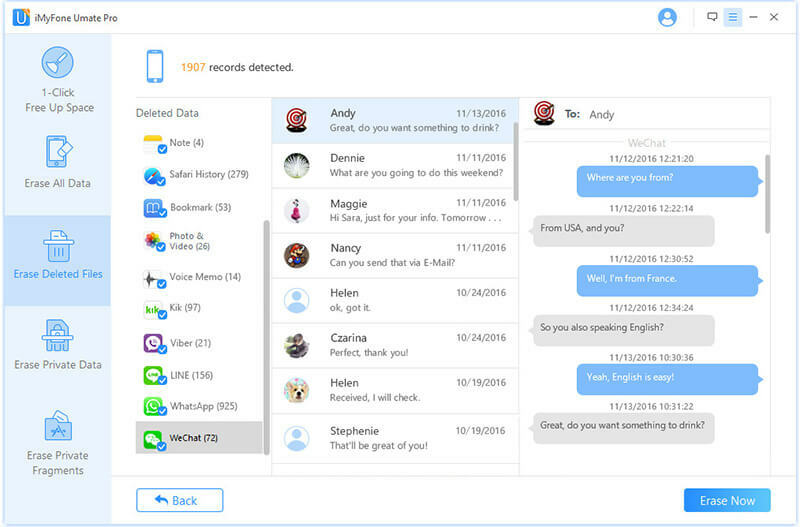 Erase Deleted Files: You can preview and wipe the previously deleted WeChat data which are still recoverable. Erase Private Fragments: This mode scans traces and fragments left by not only WeChat, but also Snapchat, Facebook, Twitter, Messenger, etc. Step 3: It will show you the results after scanning, you can click the file types to preview first. Select the unwanted files and click "Erase Now". Step 4: Because it will completely erase the data, it will ask you to double confirm. Just type "delete" into the box and click "Erase Now" button to get started. iPhone Boost-Up: So much useless data or files stored on your iPhone would influence its performance. Thoroughly removing as many as 30+ types of hidden junk files and temporary files can be achieved with 1 click here. iOS Data Transfer: Videos, audio books, music, etc. Over large files and photos can be transferred from your iPhone to computer in bulk. iPhone Space Saver: You can mass delete photos, videos, music or apps in bulk once. Completely Reset: Factory reset on iPhone is not completely safe. You should consider iMyFone instead of reset, because data erased by iMyFone is 100% unrecoverable.